It was meant to be a pork and rabbit terrine, but I found two issues with adding rabbit to the mix. Firstly, so close to Easter, it would have been slightly off putting to add bunny into the mix. Secondly, I’d ran out of time to hunt the shops for rabbit so I settled on pork belly instead. To be honest, settling on it wasn’t very hard – pork belly is one of my and Mr Chipconnoisseur’s favourite cuts. The fat adds loads of flavour and moisture to the terrine, while the drippings are great for dipping or, once chilled, spreading on fire-toasted sourdough. The other thing that adds loads more flavour is fresh herbs. It’s wonderful having a little community herb garden nearby since the caterpillars always get the better of my herbs. Smelling freshly picked thyme, rosemary and garlic, the oils rubbing off on my fingers, I could already imagine the wonderful smells that would fill the house and flavours that were going to meander through my terrine. So I marinated the meat and went off to running training – 5km time trial night. Track has never been my strong suit. But over weeks of training, I’ve discovered that thinking about delicious food relaxes me and I don’t even notice the dreaded laps counting down as I chant yummy food combinations to myself. Last week my thoughts focused on cheddar cheese, prompted by memories of a cheese and wine fundraiser organised by Heath, one of our mentors. This week I ran 10 laps of the track chanting “pork and rabbit terrine, pork and rabbit terrine, pork and rabbit terrine” to myself. I know there is no rabbit in this one, but it made more sense rhythmically than a pork belly version I was going to cook would. Although I did think about how lovely it will be to sink my teeth into the pork belly terrine the next night – those thoughts kept me going too. Ok, so I’m a little weird, but hey it got me through the night and helped me shave a couple of minutes off my last TT time. And the terrine? It was just as I imagined: rich, fragrant and moist, drizzled with some drippings and served with juicy, sour beetroot relish. Yum! Plus it will keep for a few days and can be used as a sandwich filling. For deeper flavour, the meat should be marinated for 12 hours, but if you are in a rush, marinating the meat for a couple of hours should be sufficient. If you are impateient, you can serve the warm terrine as meat loaf and weigh down and refrigerate the rest. 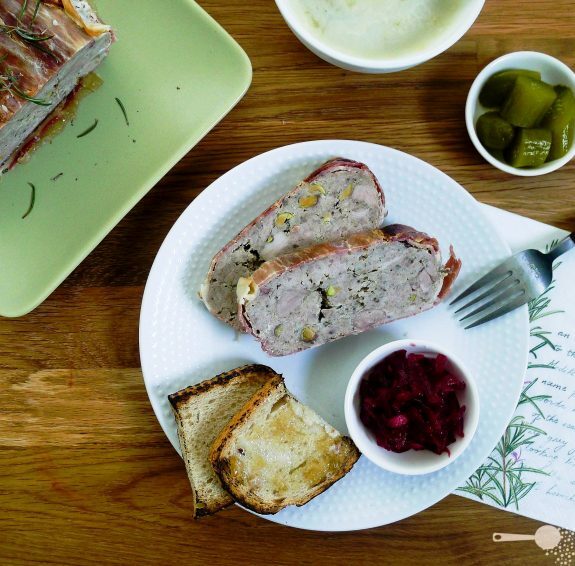 Chilled terrine is a great cold meat substitute for work lunch sandwiches. To make the terrine: chop up pork belly into 2cm chunks, discarding skin, bones and the fatty tissues. Mix pork belly with mince, adding minced garlic and finely chopped rosemary, thyme leaves, allspice, salt and pepper. Cover with cling film and refrigerate for 2 – 12 hours. When ready, add egg and roughly chopped pistachios. Mix well to combine. Line a loaf tin with prosciutto, slices overlapping and press the pork mixture into the form. Cover the top of the mixture with a couple more slices of prosciutto and wrap overhanging pieces over the top of the loaf. Cover tightly with aluminum foil. Place loaf tin into a bigger roasting tin filled upto half way with boiling water. Bake for 2 hours, checking half way if the water hasn’t evaporated – top up if needed. Remove from oven and allow to cool slightly before draining juices and fat into a bowl. If you would like to eat the terrine warm, like a meatloaf, slice into 1cm thick slices. Otherwise, place another loaf tin on top of the meat, weigh down with a couple of canned vegetable cans and allow to cool (outside) and then in the fridge for a couple of hours. Slice and serve with pickles, relishes, seeded mustard and slices of charred or grilled sourdough. Use the drained fat and stock as a spread instead of butter. To make beetroot relish, grate beetroot and peeled apple on the chunky side of the grater. Add olive oil, vinegar and pepper and mix to combine. I love terrine, love, love, love it… I’d seriously consider making this. Great recipe + gorgeous photos. Thank you Mez, I make it often in winter, such a comfort food! OMG. I didn’t think I liked terrine (and would have been totally off-put, had there been rabbit….but the idea of pork belly and prosciutto….along with all those wonderful fresh herbs and rich pistachios???? DRROOOOOOOOOOOOLING over here. Yum! Yeah, triple pork is the treat! And I just found that wrapping the chilled terrine in with more fresh herbs makes it that much more fragrant! Full pork load – I love it! I also love the apple and beetroot relish. I never met a beet I couldn’t make friends with. Great photography.